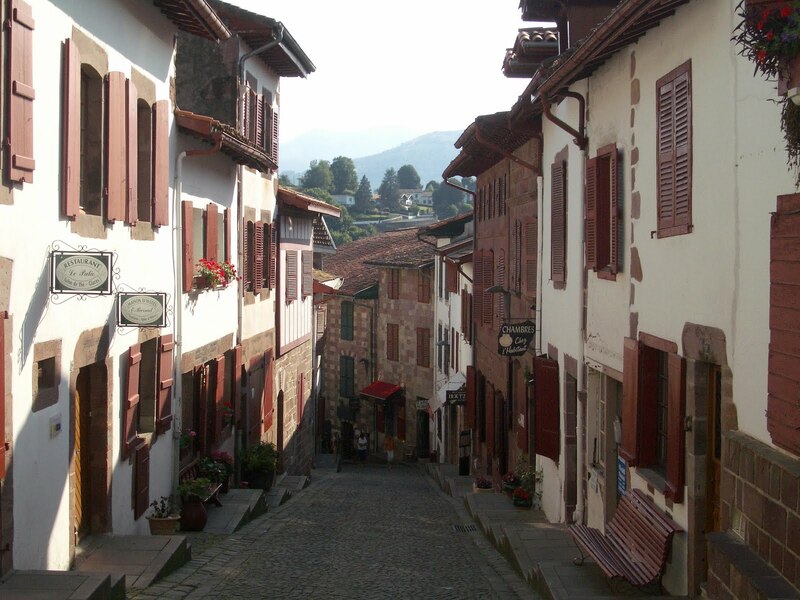 I honestly think the Pays Basque area of France is one of the most beautiful areas in this country. The Dordogne is spectacular (if you are floating in a kayak on the river), Provence is pleasing (if you are sitting at a nice cafe enjoying a meal), and the Grand Bornand is majestic (if you are on a bicycle), but the Basque area of southwest France is simply beautiful. The rolling green hills, farms, and vineyards remind me a little of Paso Robles, CA or Sonoma County, CA (in the 1970s), but it has so much more character. I drove from Bearn (Lasseube area), through Oloron-St-Marie, St-Jean-Pied-de-Port, Cambo-les-Bains, to St-Jean-De-Luz. I explored around the area (Hendaye, San Sebastian) and return home to my accommodations via the Peage. I can definitely recommend riding in the area around St-Jean-Pied-de-Port. There were lots of cyclists there. Hopping cafes, hotels, and some good roads, including the climbs of Col d'Ispeguy, and the Col Brgargui. The Rose wine that is produced in the area is excellent. I have been through the area twice now, and I think it would be a good stay. Some of the Brits fly into Biarritz and work their way east across the Pyrenees. This could be an excellent option. * I saw a cyclist in a D Durango, Colorado bike jersey today on my way back to Lasseube. Awesome! Tomorrow I have a big climb planned .... the Col d'Ichere, and the Col de la Marie Blanque. * Oh also, Monien is a nice town, Mourenx is not, don't get them mixed up, and you won't want to stay near Mourenx, is it an unattractive modern concrete city. There are lots of vineyards south of Monien.